MonsterInsights comes with different pricing plans that suit every WordPress user. Each license in MonsterInsights comes with additional features so you can get even more insights into your site visitors. You can unlock more features and addons by upgrading your MonsterInsights license. Whether it is to use MonsterInsights on additional websites or to access the advanced add-ons, this guide will help you upgrade your MonsterInsights account. 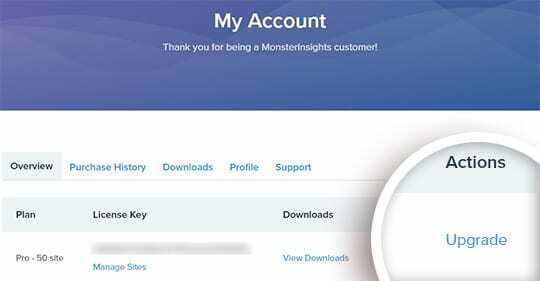 The first thing you need to do is to log in to your MonsterInsights account. 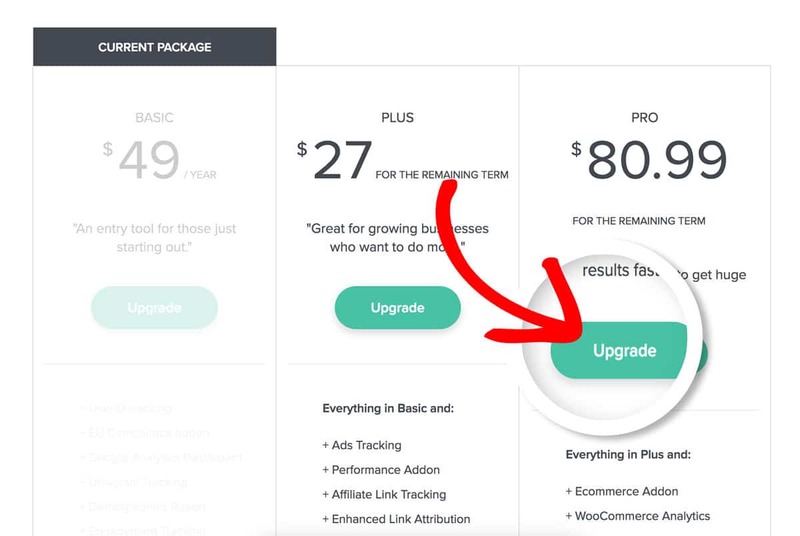 Then, click the Upgrade link on the right of your account page. Depending on your current plan, you’ll be asked to choose a higher plan. All upgrades are pro-rated, meaning the upgrade cost is the difference between the price of your new license and the current license. Choose the best upgrade plan that suits your needs and click the Upgrade button to complete the checkout process. You’ll only pay the difference: This means that if you’re upgrading from a Plus License ($99) to a Pro License ($199), the difference for a full year would be $100. This cost is pro-rated by time: So, for example, if you only have 6 months left in your license, you’ll only pay half of the upgrade cost. So your total upgrade cost would be $50. Since upgrade costs are pro-rated, the prices shown will be based on both your current license level and how much time is left in your current subscription. What this means that you only pay for the time you use. Note: when it comes time to renew your annual subscription, you will be charged the regular renewal rate for your license level. When you’ve decided which license you want, click Upgrade. This will take you to the checkout page so you can complete your purchase. After the checkout process, go back to your WordPress dashboard and navigate to Insights » Settings. Now click on the Refresh Key button and you’re done. Congrats! You’ve successfully upgraded your MonsterInsights license.